Upgrading the water systems in New Jersey’s cities and towns is a generational challenge that must serve the residents and businesses who pay the bills, and the elected officials responsible for addressing a host of community issues. Effective community engagement processes feature active the participation of community partners and ratepayers, who are able to influence the planning and management of their water infrastructure. Community support is also reflected in municipal plans, ordinances. 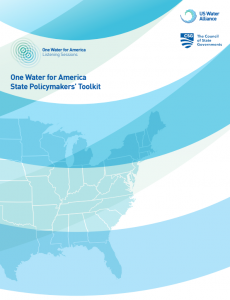 To spotlight the important role that state governments can play in advancing sustainable water management, US Water Alliance and the Council of State Governments developed this State Policymaker’s Toolkit as a resource for elected officials and staff in the executive and legislative branches of state government. For each of the Seven Big Ideas (below), they briefly summarize the key issues and then provide real world examples of how states are forging progress. The promising examples are not meant to be prescriptive, but rather serve as a starting place for the generation of potential solutions that are specific to individual state contexts. For research purposes, these examples include endnote citations back to the legislative or regulatory language that was passed and/or implemented. 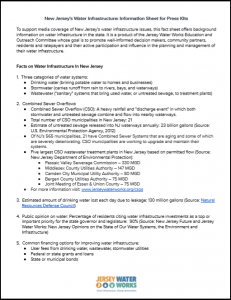 To support media coverage of New Jersey’s water infrastructure issues, this fact sheet for press kits offers background information on water infrastructure in the state. It is a product of the Jersey Water Works Education and Outreach Committee whose goal is to promote well-informed decision makers, community partners, residents and ratepayers and their active participation and influence in the planning and management of their water infrastructure. 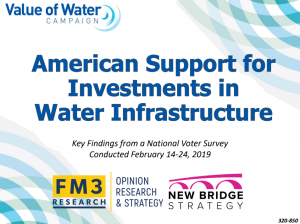 Results from 2019 Value of Water Index: American Support for Investments in Water Infrastructure shows massive bipartisan support for investing in water infrastructure. One-pager with results here. Over the past four years, the Value of Water Campaign has polled American voters to better understand their opinions about the state of our nation’s water infrastructure and what they view as priorities for action and potential solutions. The fourth annual national poll of over 1,000 American voters, was conducted by the bipartisan research team of Fairbank, Maslin, Maullin, Metz, and Associates (D) and New Bridge Strategy (R). Americans support rebuilding our nation’s infrastructure more than any other issue facing the current administration, including building a border wall, repealing or replacing Obamacare, providing permanent status for Dreamers, or increasing military defense spending. Over three-fourths of voters (79 percent) say rebuilding America’s infrastructure is extremely or very important. More than two-thirds of Americans (68 percent) support investment in water infrastructure at the national, state, and local levels — even when told that investment carries a $1.2 trillion price tag. Also, two-thirds of voters support a proactive program of water infrastructure upgrades, rather than fixing problems as they arise (67 percent). Four in five (80 percent) American voters say what they pay for water service is affordable, and more than three in five voters would be willing to pay a modest increase in local water rates to fund improved service. No other issue has nearly as much broad and bipartisan support. Support for investing in water infrastructure cuts across age, gender, party, geography, and ideology. More than three in four Democrats and Republicans agree rebuilding America’s infrastructure should be a top priority for the President and Congress this year. Water quality concerns emphasizes need for investment and innovation. Seventy-four percent of Americans — living in both urban and rural areas — are concerned about contaminants affecting their water quality. More than five in eight Americans support local water agencies increasing the use of potable recycled water in their community. 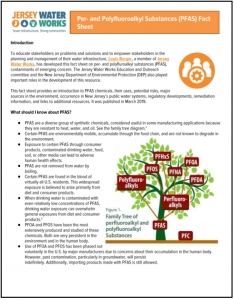 This fact sheet, Per- and Polyfluoroalkyl Substances (PFAS), provides an introduction to PFAS chemicals, their uses, potential risks, major sources in the environment, occurrence in New Jersey’s public water systems, regulatory developments, remediation information, and links to additional resources. It was published in March 2019. To educate stakeholders on problems and solutions and to empower stakeholders in the planning and management of their water infrastructure, Louis Berger, a member of Jersey Water Works, has developed this fact sheet on per- and polyfluroalkyl substances (PFAS), contaminants of emerging concern. The Jersey Water Works Education and Outreach committee and the New Jersey Department of Environmental Protection (DEP) also played important roles in the development of this resource. 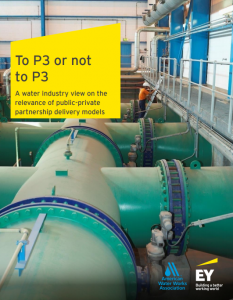 This report, To P3 or not to P3: A water industry view on the relevance of public-private partnership delivery models, details how P3s benefit municipal utilities who don’t have the experience, capacity or confidence to deliver and maintain these assets using their existing staff and resources. Public-private partnerships (P3), while no means a panacea for infrastructure delivery, offer distinct advantages to municipal water utilities in a range of circumstances. To date, P3s have been relatively limited in water, but the rationale for this is not always clear when it could be appropriately deployed to the public benefit. What are the main drivers of interest in P3 as a delivery model? What are the key barriers to successfully pursuing P3 in water and how can these be overcome? Where is P3 likely to be most appropriately deployed in the US water sector going forward?